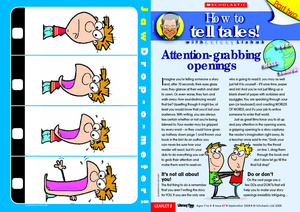 In the second part of his story writing handbook series, How to tell tales, Literacy Time PLUS Writer-in-residence, Antony Lishak explores what makes a good opening. These teachers’ notes refer to the guided reading leaflet , ‘How to tell tales 2’. Here he explains why it is important to help children gradually move away from formulaic story starters.